Las Vegas, USA – Royal Philips (NYSE: PHG, AEX: PHIA), the global leader in lighting, the development of Philips LightVibes™, a lighting solution that creates immersive light shows in cinema theatres. With cinema exhibitors needing to reach broader audiences while creating engaging entertainment experiences, Philips LightVibes helps them enhance, differentiate and repurpose their cinema spaces. This results in access to new revenue streams and better use of their assets, for example the ability to tap into the projected $1 billion by 2018 market for alternative content. The solution enables this by creating life-like in-hall experiences for viewers of alternative content and event screenings – from live operas to rock concerts and sporting fixtures. For the artists and sports clubs, the ability to have their event screened simultaneously in thousands of theatres across the globe means they can reach more fans and grow their event revenues. The solution also helps exhibitors make more money from on-screen advertising by creating dynamic and engaging pre-show theatre ambiances. 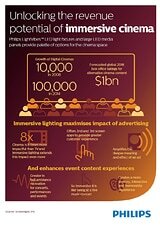 With recent interactive advertisement concepts offering exhibitors a way to increase cinema advertising viewer recall, the LightVibes system enables them to offer advertisers an interactive connected platform. This allows for ‘second screen’ and completely new ‘third screen’ immersive advertising concepts, in addition to the benefits of traditional media screens. “Just like the audience at a sell-out gig being immersed in the energy of the band’s live performance, Philips LightVibes brings the drama and emotion of a fantastic light show to the cinema theatre-setting, complementing the content on the silver screen,” said Ronald Maandonks, Business Development Director, at Philips Lighting. The Philips Special Lighting booth number at CinemaCon 2014 is 2607A.